In appropriate weather, the products tanker SUMMER lies patiently at anchor in Brodick Bay, having arrived a day earlier from Stanlow. She was awaiting clearance to head upfirth to Finnart to load a cargo for Belfast. SUMMER, registered in the Marshall Islands to Greek owners, was built in Korea by 21st Century Shipbuilding, and delivered in May 2009. 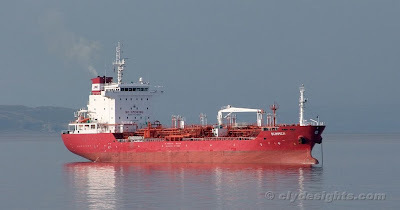 At 13,022 tonnes deadweight, she is 128.6 metres long and is a sister of the numerous Marida Tankers' 'M' class ships that have been seen frequently over the past few months.